Why does the top leadership of the government call angry press conferences to question the conversation Rahul Gandhi had with a diverse Muslim group? Samaira remembers seeking out other Muslims afterwards: “We had never before come together, hardly ever spoken with each other.” For Muslims like Samaira, the ascent from being aware of their identity to plain paranoia because of it happens very quickly. It does not need to be in the face of a riot or a terror activity. It can happen just by the knowledge that events that pigeonhole us as the “other” are taking place constantly across the country. This “otherisation” is not an overnight phenomenon. It has simmered in our social cauldron since the First War of Indian Independence. My own family had funded the 1857 revolt and all the men were hung from the four trees at Allahabad Chowk by the British. The process of breaking up the core strength of Indianness was put into action then – division along religious lines. The world over, there is not a god bigger than the one who is made to feel threatened the most. Shared land got divided, shared language got divided and shared history got divided. Imperial designs handed down to us on our Independence Day were not just related to the way our society functioned, but also the way our leadership imbibed the opportunism that divisiveness provided. Shah Bano being a case in point. The unlocking of the disputed Babri Masjid being another and standing by as the demolition took place yet another. It has only been a downward spiral since. Samaira and my father are separated by a generation but united by experience. It was similar paranoia, generated by the communal riots that followed the destruction of the Babri Masjid, that drove my father, then in Kolkata, to go by the name PJ Bharti. PJ being the initials of his actual name and Bharti – of Bharat – denoting his nationality. The author and historian Rana Safvi had similarly asked her children not to address her as “amma” during a long night’s journey on a train full of karsevaks. In India today, the word “minority” has come to be casually used only for the religious minority. Being over-abused has dehumanised the word. What is being a minority? The only government figure we choose not to believe today is the percentage of Muslims in India – only 14.2%. Most of the community is still fighting for the basics – bijli, paani, makaan, naukri – just like everyone else. But what has happened to them is unique in how they have been silently marginalised while being loudly “pandered to”, rapidly isolated and pushed into ghettos while being “appeased”; tacitly persecuted for their identity while being overtly “bent over backwards to please”. This narrative has been constructed almost as a collaborative effort between the two major rival political parties in India, the Congress and the Bharatiya Janata Party. When the BJP recently accused the Congress of being a party for Muslim men alone (on the basis of seemingly fake news), I could only smirk. I could not deny how Muslim women had been pulled into the lowest strata of patronised voiceless existence post-Shah Bano. 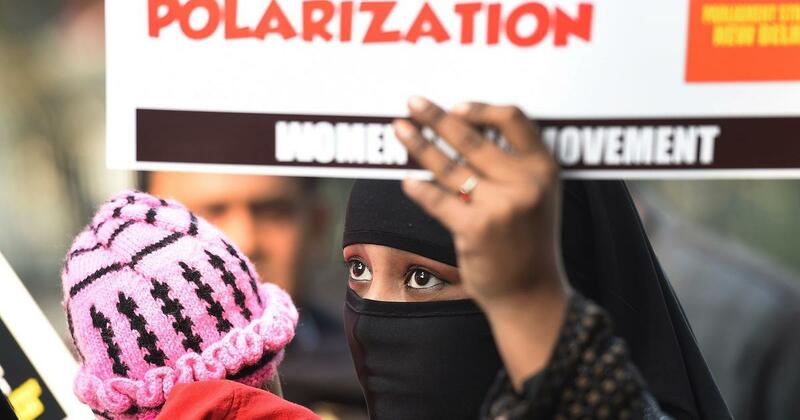 Having said that, the BJP has further alienated both the Muslim man and the Muslim woman – it has sealed the process of their otherisation and laid the road to their caricaturist demonisation. The idea of India is that we live together but the reality of India today is increasingly there in its ghettos. In the absence of the majority experiencing the diversity of Muslims in their daily interaction, the caricatured Muslim on their TV screen becomes the reality. And what do we see there? Sherwani-clad orators often described as politicians, a screaming maulana, a burkha-clad “halala victim”, a cow smuggler, an “anti-national” stone pelter, a gun-toting scull-capped militant, or the man killed as a result of “public outrage”. Semantics matter. When was the last time your local temple priest was called on national TV to represent all Hindus? Never. Why then do incompetent, self-serving, self-proclaiming maulanas rule our collective psyche as Muslim “dharm guru”? When was the last time a professionally diverse group of Hindus meeting a political leader send the government in a tizzy? Why does the top leadership of the government call angry press conferences to question the conversation Rahul Gandhi had with a diverse Muslim group? Why does it want to silence the diversity among Muslims? Why does it not want anyone to actually initiate a dialogue and #TalkToAMuslim? Or are the Muslim caricatures on the TV screen alone allowed to speak? Stories of paranoia engulf us. Any Muslim will tell you of the unnamed fear they feel when they see their name on the reservation chart pasted on a train compartment. That lone Muslim name always stands out in mind and we find ourselves fidgeting throughout the journey. Knowing we are marked by name, compartment and seat. More so since Junaid Khan was killed. For the last few years, we have not carried any meat while returning from our hometown in western Uttar Pradesh after Eid. Traditionally, we would carry our share of meat for our maids, drivers, helpers and other needy people in our vicinity. Also for friends who demanded Eid ki biryani and kebabs. We dare not any more as mere suspicion of carrying meat could lead to one being lynched, with the police, as has often happened lately, filing cases against the victim rather than the perpetrators. Who, by the way, get garlanded. Paranoia is the worst as we go down the class or caste ladder and it is compounded by the political leadership supporting, congratulating or defending the perpetrators of crimes against Muslims and Dalits. A 109-country study published this week in the journal Science Advances reports that secularism and tolerance for individual rights is needed for economic development. We need look no further than Singapore to see this in practice. Our leaders often praise Singapore for its economic progress; we may do well to learn from them how their multicultural and pluralistic society has aided this growth. Managing diversity and making tolerance a cornerstone of their culture has long been a mandate of that country’s government and it is systematically executed in every aspect of life – be it schools, public spaces or workplaces. All our talk of Acche Din will unravel if India continues down the path it has chosen of late. Where is the gentle embrace? Who is providing the soothing touch? Who is doing the work of allaying fears, healing wounds, reassuring those hit the worst? Who is courageous enough to walk the talk, shunning party loyalties and politics? Muslims are India’s political untouchables. No wonder even five-year-old children now berate their classmates and say “I hate Muslims.” Make no mistake, the otherisation of Muslims is complete, our absolute demonisation is what is left. Nazia Erum is the author of Mothering A Muslim.